Degrees are pretty much the de facto unit of measurement for angles in the real world. They serve an equally popular role on the web as well for a variety of scenarios we will run into. 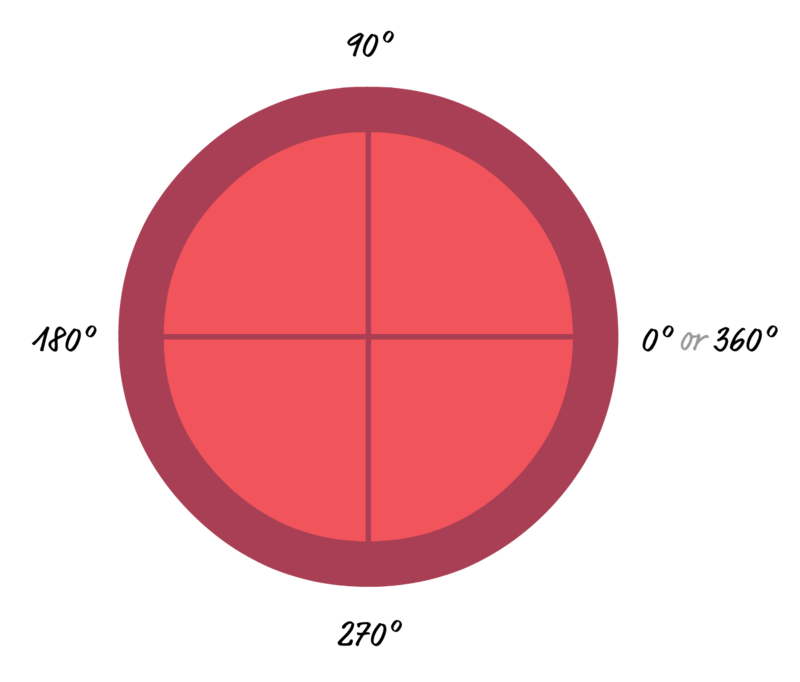 Fortunately, degrees in the real world and degrees in our virtual world share a lot of similarities, so this article is going to be a nice and fun refresher that will cover some basics and then dive into some implementation details. In the first variation, the value we are specifying is actually -90 degrees. The resulting path to the angle is clockwise and stops at the 270 degree (360 degree - 90 degree) mark. In the second variation, the value we are specifying is 420 degrees. This means we go one full rotation (360 degrees) and then go another 60 degrees before stopping. 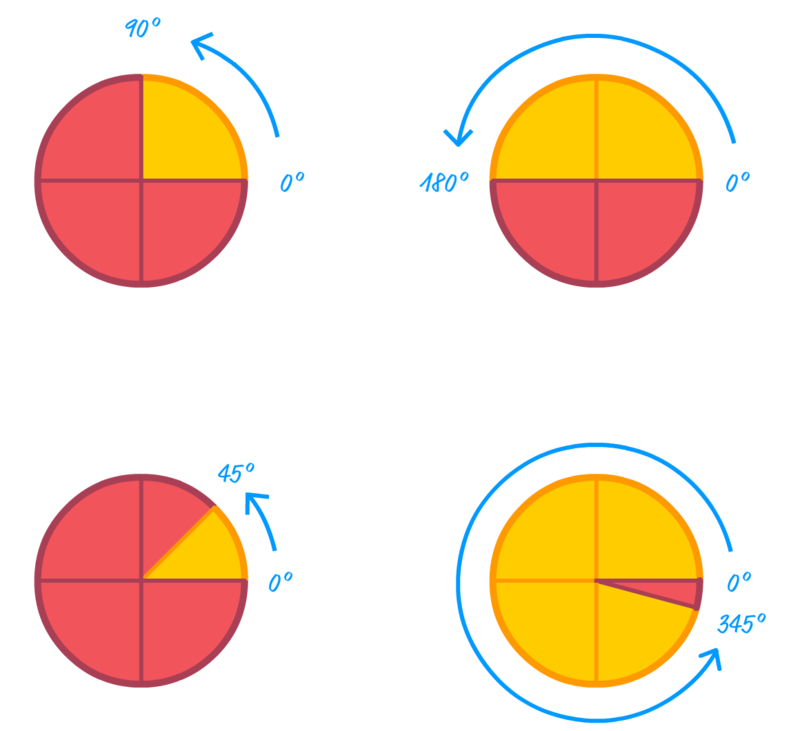 In most situations, the final degree value is just 270 degrees for the first variation and 60 degrees for the second variation. Whether the value was negative or not doesn't matter. The number of rotations we took to get to the final value between 0 and 360 doesn't matter either. Again, this is only true for most situations. Some situations, like those involving animations, the steps we took to normalize the final degree value turns out to be important. We'll talk about that later. Now that we have covered some of the basic theory around what degrees represent, it's time to kick it up a few notches and see examples of degrees used in real-life situations on the web. Do you see something odd about the rotation? A 37 degree rotation should look like the following, right? This seems a bit strange, but that's just how things are. It is simply something we need to remember and adjust what we ultimately want accordingly. Now, we are almost done here! There is just one more thing to cover. Earlier, we read that having a degree value outside the 0 and 360 degrees range will just normalize the value back to a range within 0 and 360. We also saw that, most of the time, the negativeness of a negative value or how many multiples greater than 360 a value is doesn't matter. In all of these cases, rotating our rectangle by 37 degrees, 397 degrees, 757 degrees, or -323 degrees gives the same final result. The only time this result isn't strictly the same is when we are animating. 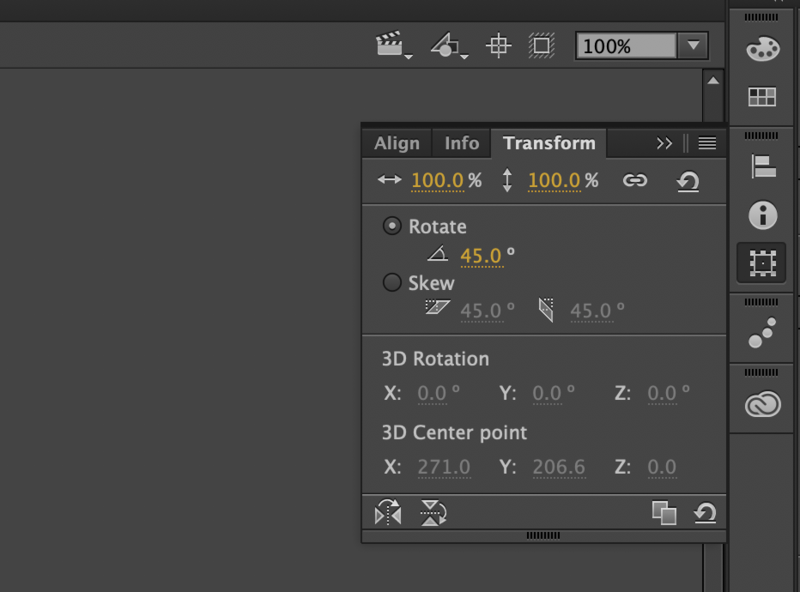 When working with animations, both the final result and how we get to the final result are important. That is an important additional detail, for a negative value means we can see the rotation going counter clockwise until we get to our final degree value. A number greater than 360 means we keep making full rotations until we get to our final degree value. All of this makes more sense when we actually can actually visualize what is happening. Notice how each of the rectangles animate, and you can view the full source here if you are curious to go deeper. For the rectangle that is animating to 37 degrees, there is nothing interesting going on there. That's a good thing haha. 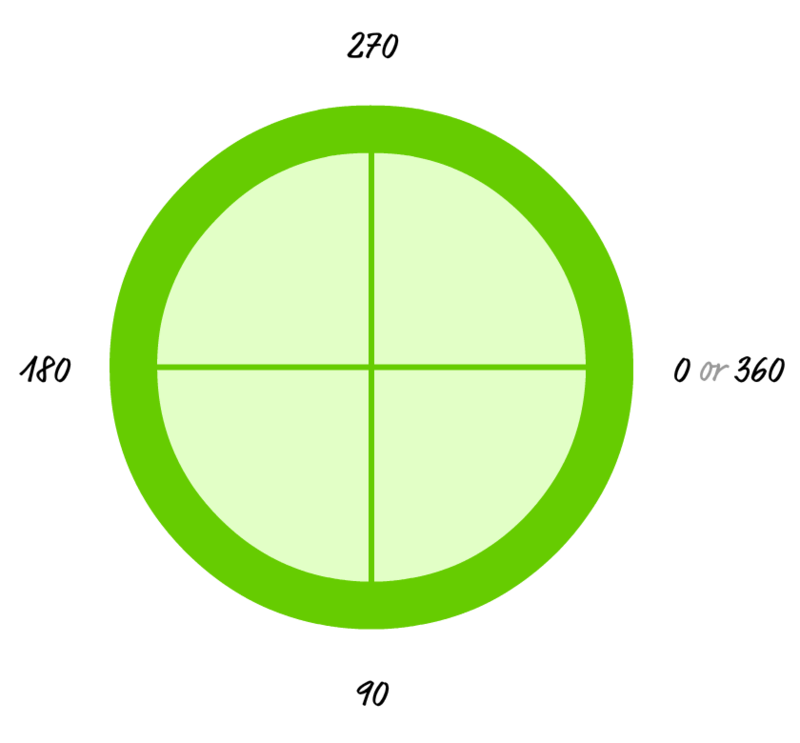 For the rectangle that is animating to 397 degrees, the rectangle makes one full rotation (360 + 37) before stopping at the 37 degree mark. Similarly, the 757 degrees rectangle rotates twice (360 + 360 + 37) before stopping at 37 degrees. 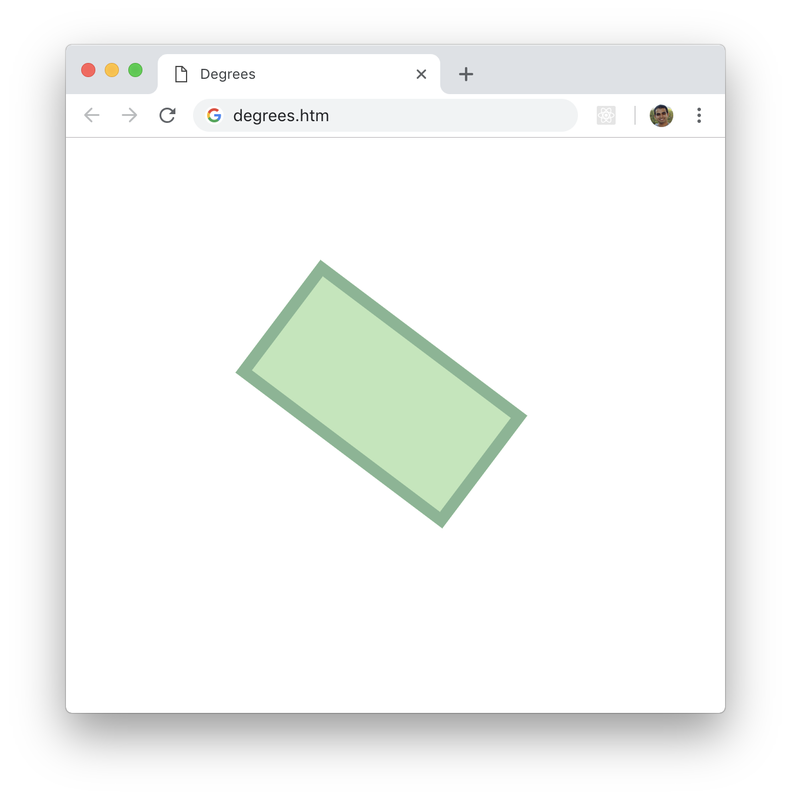 Lastly, the -323 degrees rectangle ends at the 37 degree value like all of the other rectangles, but it rotates counterclockwise to get there instead. 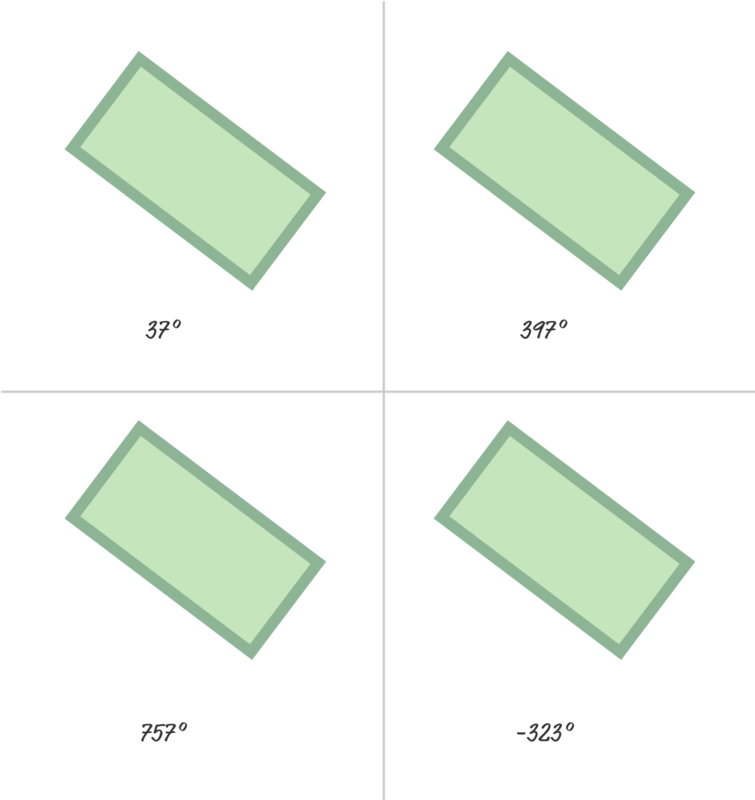 Where our rectangles end up is the same in all four cases. How they got there was wildly different. Phew. At this point, we've sufficiently covered a whole lot (and then some!) 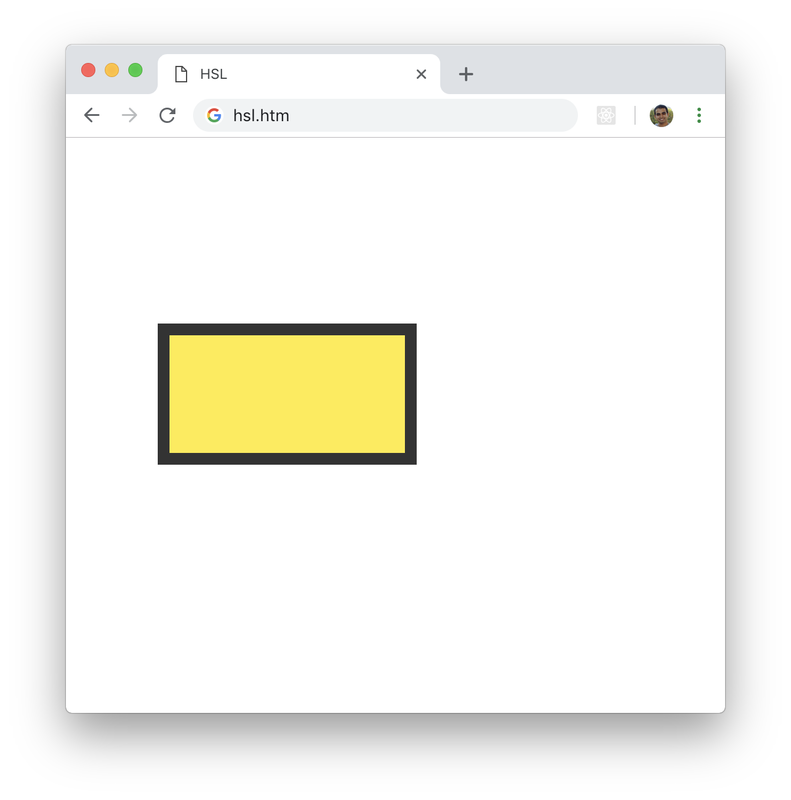 around how degree values work when rotating an element in CSS. We are going to shift gears a little ibt. 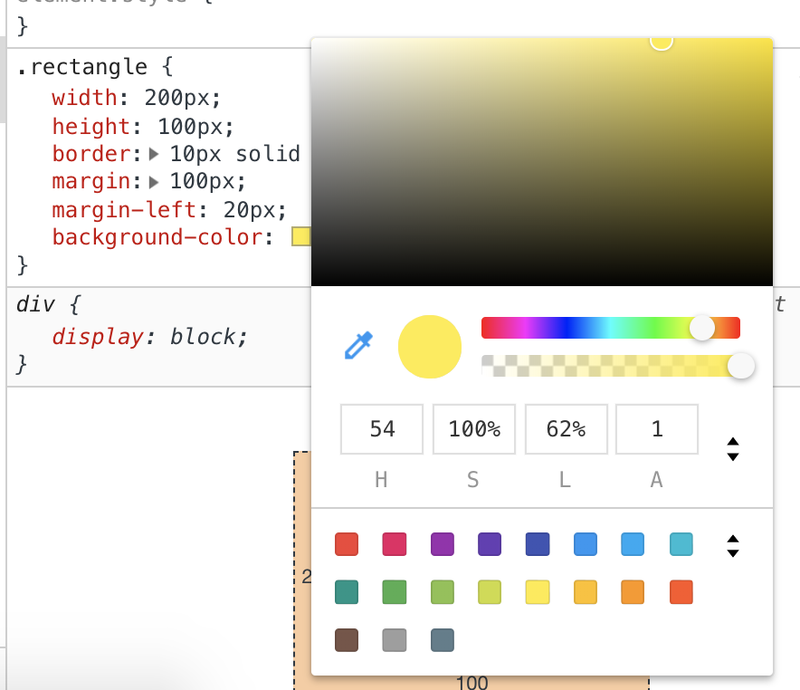 We have several ways to specify colors in CSS. The classics are the hexadecimal and RGB formats that we've been using for thousands of years. There is one more color format that you can use instead. That color format is known as HSL. As with all cool things, HSL is an acronym and the individual letters stand for Hue, Saturation, Lightness. At this point, you may be wondering where I am going with this. 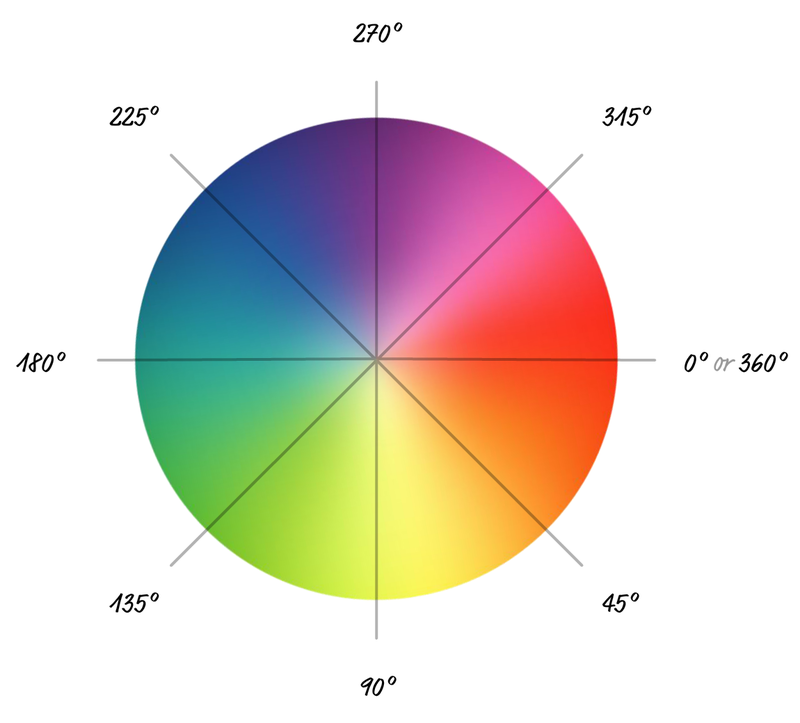 What does specifying colors in the HSL format have to do with working with degrees? Glad you should ask! A HSL color (and by extension the hsla function) is made up of four values: hue, saturation, lightness, alpha (transparency). Similarly, when you animate the hue value, the number of 360 multiples you have as part of your degree value will affect how the color animates. Even here, how we get to the final value matters when dealing with animation.